The software-defined radio (SDR) in which most of a ham radio’s functions are implemented by software is one of the most significant changes in ham radio technology since the transistor; some people believe that it will largely displace traditional radio construction by 2020. What would happen if the entire radio were implemented in a microprocessor? You can see that day rapidly approaching in FlexRadio’s FLEX-6000 series. In an SDR, except for the receiver input and transmitter output circuits, the signal-handling part of the “radio” is a program. You can change the program any time you want to make the SDR do something else. In an SDR, after a some filtering and conditioning, the incoming radio signal is converted to digital data. From there, the signal is all data until it’s converted back to audio for the operator — or not, because when you’re using the digital modes to communicate, you may not need to hear the signal at all; you need only to see characters on the screen. Going the other way, the outbound signal only needs to be amplified before being applied to the antenna and radiated into space. 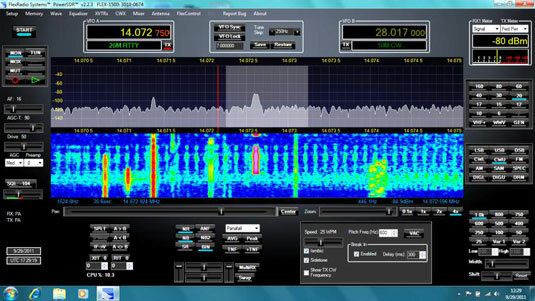 Thus far, several SDR ham radio transceivers are available, and hams are finding the latest models to be strong performers. (For receiving only, SDRs have even been built into USB memory-stick form factors.) The Elecraft KX3 contains all the necessary hardware in a stand-alone box; it looks more or less like a traditional radio, although the controls have some different functions. The FlexRadio 6000-series of SDRs uses a PC as the control and user interface. On a PC, a typical SDR displays signals across a frequency range. This display is called a panadapter view. Below it is the waterfall display, with colors that show which signals are strongest over time. You use a mouse to select signals and click operating controls. Hams are just beginning to scratch the surface of what SDR can do. All that data onscreen can just as easily be passed to more programs. What will hams do with it? Nobody knows yet. It’s an exciting time for ham radio!